The River Street Inn is a 200 year old converted cotton warehouse overlooking the Savannah River and Historic River Street. The River Street Inn is in the center of the Historic District. Our unsurpassed location is within walking distance of downtown Savannahs premier shops restaurants and attractions. 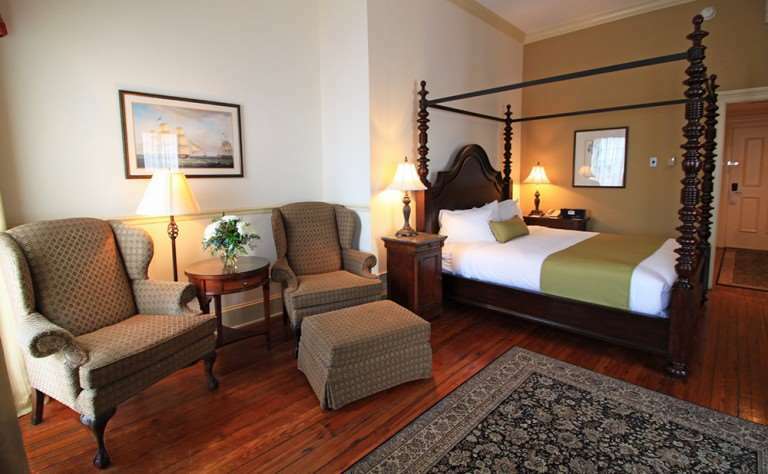 The River Street Inn overlooks the Savannah River in the heart of Savannahs famous Historic District. Oatland Island Wildlife CenterThe Oatland Island Wildlife Center of Savannah is home to more than 150 animals from 50 different species. The animals are exhibited in large natural habitats along a rustic trail through forest and marsh lands. Savannah Civic CenterThe Savannah Civic Center is a first-class multi - purpose facility which hosts over 500 annual offerings including a wide spectrum of entertainment sports and cultural events. From large-scale concerts conventions exhibits. Savannah International Trade and Convention Centerthe Savannah International Trade and Convention Center SITCC was built to support the goals of the Georgia International and Maritime Trade Center Authority to enhance the economic and tourism environment for Savannah Chatham County. Savannah TheaterFirst opened in 1818 the Savannah Theatre located on Chippewa Square is one of the United States oldest continually - operating theatres. Due to multiple fires the structure has been both a live performance venue and a movie theater. Telfair MuseumsTelfair Museums was the first public art museum in the Southern United States. Founded through the bequest of Mary Telfair 17911875 a prominent local citizen and operated by the Georgia Historical Society until 1920. The Lucas Theater for the ArtsThe Lucas Theatre is located in the heart of Savannah downtown historic district and is on the National Register of Historic Places. Built in 1921 it underwent a massive restoration during the 1990s. It reopened in 2000 as a premier venue for film. Bonaventure CemeteryBonaventure Cemetery was developed on the historically significant site of Bonaventure Plantation. The peaceful setting rests on a scenic bluff of the Wilmington River east of Savannah. The site was purchased for a private cemetery in 1846. Forsyth ParkForsyth Park is a large city park that occupies 30 acres 0.12 km2 in the historic district. It contains walking paths a childrens play area a Fragrant Garden for the blind a large fountain tennis courts basketball courts areas for soccer. Historic River StreetHistoric River Street paved with 200 - year - old cobblestones runs along the length of the Savannah River. Once lined with warehouses holding King Cotton the neighborhood never fully recovered from the the yellow - fever epidemic. Savannahs Historic DistrictThe Historic District of Savannah is the heart of one of the most beautiful cities in the world with cobblestone streets manicured gardens and oak-shaded parks drizzling with silvery Spanish Moss.